Blenheim owners Morten Sohlberg & Min Ye delivered the Keynote Speech at Governor Cuomo's Sustainability conference upstate New York. Chef Jordan Anderson of Blenheim is featured on StarChefs. Click here! The Wall Street Journal digs into our farm-to-table brunch menu. Eater's Green Scene unearths the story and process behind our farm and restaurant. Gear Patrol's first edition of "Late Plates" features owner Morten Sohlberg, fearless restaurateur and pig surgeon. We're proud to be number 5 on Thrillist's best new NYC brunches! We are honored to have been selected by Clean Plates as one of the top 100 cleanest eating spots in NYC. Blenheim is one of NYC's 15 hottest brunch spots! The menu at Blenheim highlights the bounty of the owners' farm upstate. Blenheim may be as farm-to-table as it gets, but you won't find any typical flavors at the bar or on your plate. Blenheim takes farm fresh to the next level. Chef Ryan shares with Q some tips on using currants in new, inventive ways. The food and ambiance at Blenheim evoke the dreamy farm where much of its produce and meat come from. Luxury Attache spotlights Blenheim. Highlights include farm-to-table cuisine and Jonathan Russell's expertly curated cocktails. Owners Morten and Min weld the lines between restaurant and farm to bring a seasonally inspired dining experience to the West Village. Restaurateurs and farmers Morten Sohlberg and Min Ye source almost all of the ingredients, from vegetables to maple syrup, from their 150-acre farm in the Catskills. "For my paleo pals who want to stick pretty closely to the rules, Blenheim is going to be a safe and delicious bet." Stan Sagner gives Blenheim a glowing 4-star review in the Daily News. 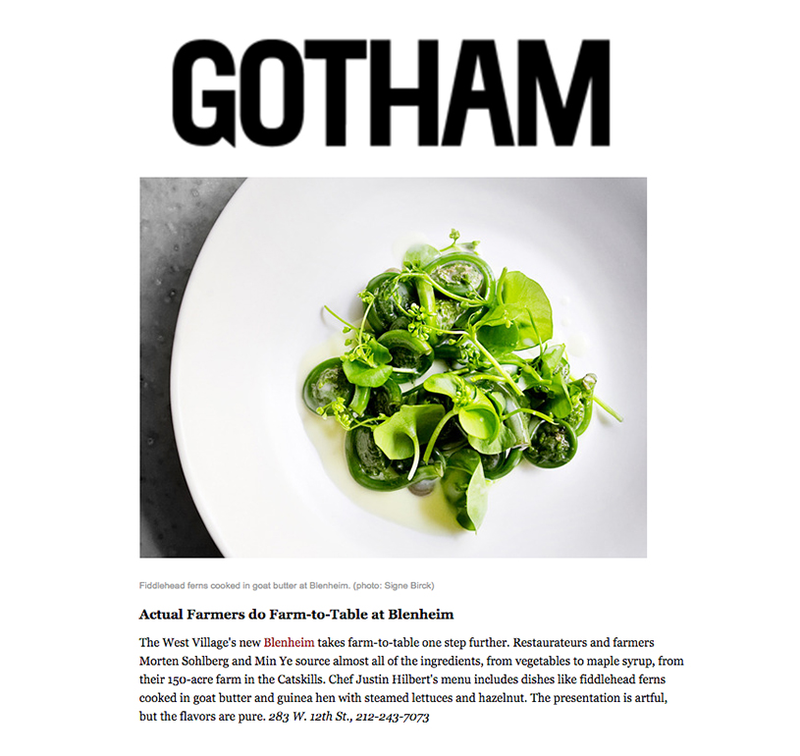 Du Jour names us one of the top NYC restaurants to try in 2015. Add us to your bucket list! Zagat offers a glimpse inside the farm-to-table journey at Blenheim, aired on NY1. "Blenheim is a love letter to a less-developed land, something outside the city . . ."
Blenheim makes Eater's Fall Lunch Heatmap! Chef Ryan Tate's tasting menus steal the spotlight with devastatingly good sous-vide hanger steak and a luscious mint ice cream and chocolate ganache. Interior Design ranks Blenheim one of New York's Top 10 New and Noteworthy Restaurants. E! rates Blenheim best farm fresh menu to enjoy during fashion week! Marc Shepard gives Blenheim a two star review. Blenheim goes beyond the term farm-to-table to bring fresh ingredients and a creative menu from its own farm. Michelin-starred Chef Ryan Tate joins the Blenheim team. A first look at Blenheim, a farm-to-table restaurant showcasing ingredients from the owners' farm in the Catskills. According to Urban Daddy, we're a great spot for a double date! "Ask for the corner booth in the window and the multicourse tasting menu." "Blenheim truly embraces the locavore movement by sourcing the majority of its produce from its 150 acre farm in the Catskills." New Blenheim Restaurant is based on the ever-changing notes of nature and an interplay between the farm and the restaurant. "Not many of these restaurants can say they have a farm of their own. Blenheim can." Acclaimed Scandinavian food magazine Nord explores our farm-to-table journey. Zagat rates us one of New York's 10 sexiest restaurants! A diner's journey through our farm-to-table Restaurant Week menu. The Epoch Times considers Blenheim to be "beyond farm-to-table". Blenheim's corn cremeux wows the folks at Tasting Table. Warm up with our sweet potato gnocchi, with smoked pumpkin seeds, lemon cream and nasturtium. Blenheim makes the list of top ten favorite West Village spots. Blenheim is featured as one of New York's Ten New Venues for Fall Meetings and Events. Morten and Ryan on the challenges and joys of working with their own farm. A look inside Blenheim's simple and approachable farm-to-table design. Our Maple Flip cocktail makes the list of new fall cocktails you don't want to miss. Executive Chef Ryan Tate brings exciting dishes like Japanese mackerel with sea buckthorn and English pea dumplings. Tired of worrying about where their food was coming from, owners Morten and Min bought a farm where they could produce their own food that supplies farm-to-table restaurant Blenheim. Morten Sohlberg has turned one of his Smorgas Chef restaurants into this rustic showcase for products from the 150-acre farm near the town of Blenheim in the Catskills that he owns with his wife, Min Ye. Ryan Tate, who was the executive chef at Le Restaurant in TriBeCa which closed recently, has become the executive chef at Blenheim in the West Village. Running a farm-to-table restaurant is heaps easier when you have 150 acres of farmland at your disposal.